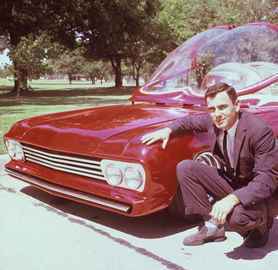 Darryl Starbird is an influential custom car and hot rod customizer known for stylistic quirks like bubble tops. Starbird created some of his most iconic designs during the late 1950s and early 1960s, during which time he rose to fame as one of the most influential car designers and customizers of his time. Starbird currently owns and operates Darryl Starbird's National Rod & Custom Car Hall of Fame Museum in Afton, Oklahoma. He was inducted into the Diecast Hall of Fame in 2011 as an Automotive Legend.